The musical background of Fux is largely unknown to us – if not actually rather perplexing: he suddenly appeared in musical Vienna and rapidly became Court Music Director to the Habsburgs, arguably the most important position open to any musician in the whole of Europe. Born the year after Purcell, in Graz, his musical talents were obvious as a child and his early training must have led him - via a law degree in Ingolstadt which he did not complete - to Vienna, where he was married at 36 and was working as imperial court composer as well as music director at St Stephen’s cathedral before he was forty. Further prestigious court appointments followed and amongst his pupils were Muffat and Zelenka. Fux died at the age of 80 having composed numerous masses and oratorios – indeed about two thirds of his extensive output was sacred music. He also composed operas and orchestral pieces. His most famous work, the influential composition primer, Gradus ad Parnassum, was used particularly for the analysis and study of counterpoint as perfected by Palestrina well into the twentieth century long after his compositions had become largely unknown. Haydn, Mozart and Beethoven all used Gradus ad Parnassum. Fux is due for a revival once more: his work is original, well constructed and – above all – amply varied in tone and invention. The five instrumental works on the CD reviewed here were probably written around 1700; they’re associated with name-days and birthdays of members of the Imperial Family in Vienna. The playing of the Freiburger Barockorchester under von der Goltz is superb; it truly sparkles yet is considered and free of all affectation. Transparent and successfully putting the music first, the ensemble and virtuoso work is without a single weakness. The delight conferred on the listener of the lively and original repertoire together with such high quality playing mean that this CD can be thoroughly recommended. Everything except the simple Rondeau in C (also based on dance), which ends this perhaps a little short-measured offering at just under an hour and four minutes, is a world premiere recording. Some of the seven movements of the Overture (the longest work here at twenty minutes) have birds’ names and are inspired both by birds and dance music. The Freiburgers make the most of this without being the extra sounds becoming intrusive; they get the programme - which actually does have an internal integrity to it stylistically: this is not a mere ‘collection’ of Fux - off to an upbeat start. The Overture has bouncy, sprung and somewhat chromatic music redolent of Lully. 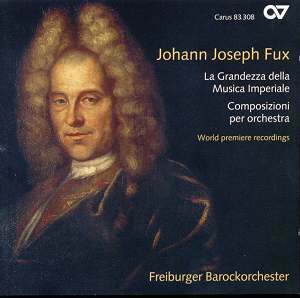 The precision with which the Freiburger Barockorchester executes the at times complex rhythms and delights in the fresh and rich sonorities is exemplary. The descriptive Concerto in D, ‘The Night’s Sweetnesses and Bitternesses’, does have elements of a tone poem; one is intrigued by the way the Night Watchman’s striking song is woven into a richer contrapuntal whole, and why. This is an evocative five-movement serenade with some of the most beautiful music on the CD. The dynamic is nicely varied; the music never loses direction and the structure is clearly exposed by the performers. The Intrada is actually a Suite in the sense that it too is composed of four truly entrancing dance movements with what is effectively a concerto for violino piccolo with a cadenza and many virtuosic opportunities. For some not attuned to the idiom, there was always a minimal danger that these works could sound too similar one to another. Not the case here – they’re as inventive as the Handel suites they at times resemble - nor throughout the entire disc. For example, just as you have settled into one of the five movements of the Suite In C, the mood changes, the tempo contrasts and the orchestral colour invites you to catch it up. Splendid. It’s a processional experiment, almost. The four-part string ensemble is augmented by woodwinds, brass and timpani making for some of the most harmoniously and melodically exciting music on the CD. This is music clearly at the end of the mid-European Baroque: the Freiburgers have avoided the temptation to look either forward to the more personal style of classical composers or elsewhere to roots in Purcell, Lully and Vivaldi. The result is an alert, joyful and colourful experience. But this is to say little of the variety and beauty of the music. There are 22 separate pieces on this CD and every one has something different to offer. If there were a criticism, it might be that the recording is a little too reverberant – in places. The Paulussaal in Freiburg is not exactly dry in acoustic and is well known for its fidelity to musical detail and depth. Yet at times the engineers appear to have enhanced the sound; unnecessarily and a touch intrusively; and a little to the detriment of the strings. The CD’s liner notes are informative and easy to read, despite the odd spelling mistake and have a striking photograph of the twenty-strong Freiburger Barockorchester. If you want to explore some of the more intriguing avenues of the Austro-Hungarian late-Baroque, be taken into some fresh ensemble realms or just to enjoy wonderful and original music from the time of J.S. Bach which sounds nothing like Bach, this is a CD to consider very seriously.